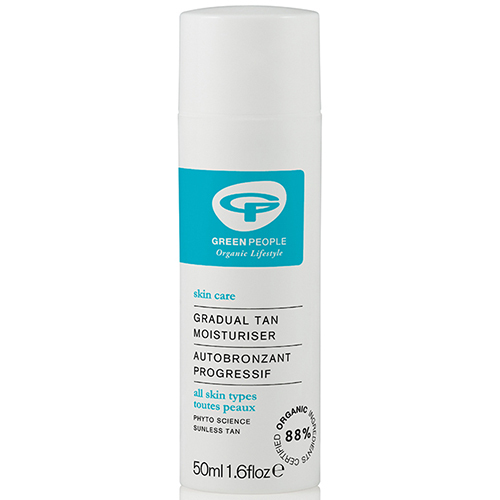 Green People Gradual Tan Moisturiser is a hydrating moisturiser for a sun-kissed look, it is 88% organic and suitable for all skin types. Get a daily dose of radiance - Simple, sun-free tanning for a natural looking glow. Green People’s Certified Organic, Gradual Tan Moisturiser is perfect for creating a beautiful light tan all year round without the need for sun exposure. This daily moisturiser delivers a gentle build-up of colour with 4-6 hours whilst nourishing and balancing the skin with prebiotics and antioxidants. Aqua (Spring Water), Helianthus Annuus (Sunflower) Seed Oil*, Dihydroxyacetone (From Sugar And Glycerin), Cannabis Sativa (Hemp) Seed Oil*, Cetearyl Glucoside (Plant Derived Emulsifier), Cetearyl Alcohol (Emulsifying Plant Wax), Rosa Moschata (Rosehip) Seed Oil*, Alpha-Glucan Oligosaccharide (Prebiotic), Glyceryl Stearate (Plant Derived Emulsifier), Levulinic Acid (Plant Derived), Butyrospermum Parkii (Shea) Butter*^, Aloe Barbadensis (Aloe Vera) Leaf Juice Powder*, Sclerotium Gum (Natural Gum), Xanthan Gum (Corn Starch Gum), Aroma [Citrus Aurantium Dulcis (Sweet Orange) Peel Oil*, Citrus Nobilis (Mandarin) Peel Oil*, Citrus Limon (Lemon) Peel Oil*, Cinnamomum Camphora (Ho Wood) Bark Oil, Lavandula Angustifolia (Lavender) Herb Oil*^, Vanilla Planifolia (Vanilla) Fruit Extract*^], Camellia Sinensis (Green Tea) Leaf Extract*, Rosmarinus Officinalis (Rosemary) Leaf Extract*, Sodium Lauryl Glucose Carboxylate (Plant Derived), Lauryl Glucoside (Plant Derived), Sodium Stearoyl Glutamate (Plant Derived Emulsifier), Potassium Sorbate, Citric Acid, Limonene*, Linalool*, Geraniol*. Wash hands after each application. Re-apply daily for a sun-kissed glow. Below are reviews of Green People Gradual Tan Moisturiser - 50ml by bodykind customers. If you have tried this product we'd love to hear what you think so please leave a review.